This is a story about Vincent. Vincent's been on sabbatical recently, and promised his professor to visit his old friend. Because of this, some say Vincent's a nice fellow. But he's not, honestly. Lucky for him, Vincent finds all the excuses he needs when the "old friend" turns out to be Victoria, a mysterious vampire with two wicked children. 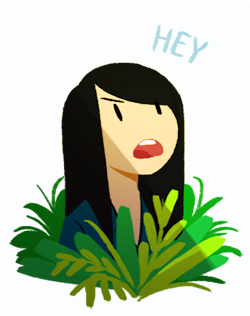 Diana Huh grew up in rainy Oregon, currently living in LA and working as a storyboard artist at Dreamworks TV. She's probably hungry and sleepy. Right now. Logo/website design by Yas Imamura!